Requests (or reservations) may be placed on most items. Common exceptions include items in reference or hourly collections. There is a limit to the number of requests you can place at a time. 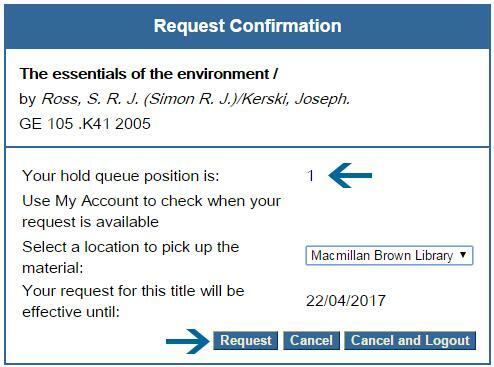 You can view your requests via your library account. You can usually choose your preferred library location for pickup, but there are some exceptions (valid pickup locations for the requested item will show as options). Daily loans from high demand collections can only be picked up from their home library. Distance borrowers may choose the postal service for most standard and daily items in order to have items posted to them, or they may choose a library location if they wish to collect the item in person. Special collection items from storage may only be viewed in the reading room at the Macmillan Brown Library - the pickup location will automatically be assigned to the Macmillan Brown Library. Collection and delivery of items not already on loan will normally take 3-4 days and may take longer, depending on the selected pick-up location. 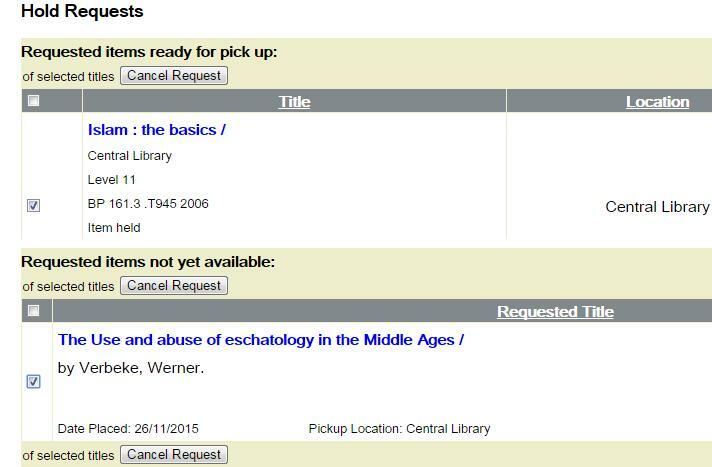 Requests are made using the library catalogue. Items which are not due within the next 7 days will be recalled for you. 1. 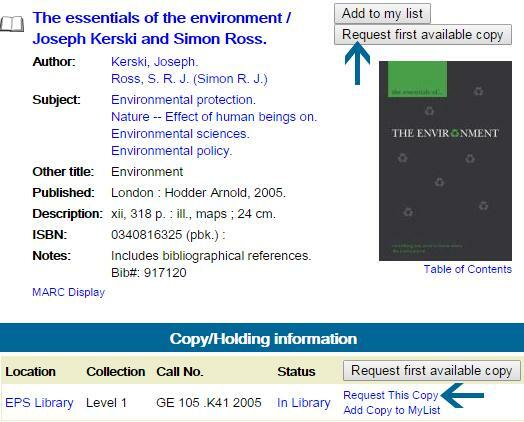 Click "Request first available copy"
Note: Request This Copy should only be used to request specific volumes or issues from a title. In all other instances Request first available copy is likely to be the most efficient option. If you are not a UC student or staff member, you will need to use your Library barcode and PIN number. Note your position in the queue, then select a pickup location using the dropdown menu. Click Request to confirm your request. Email is the preferred way of notifying you when your request is ready for you to collect. 3 day items may also be notified by txt message.